Storytelling + Research = LoiS: Hello to the "Hello Girls"
Please help me decide something. This week I've started my preview performances of the stories of the Hello Girls, the World War I bi-lingual telephone operators of the U.S. Army Signal Corps. It took 60 years, but they were finally recognized as the first women's combatants. I will appear as Oleda Joure Christides from Marine City, but also mention many others including Cora Bartlett of Hillsdale County Michigan, the only one of their number lost, although typhoid was the cause. These soldiers, for that is how they were addressed, had to pay to have their uniforms made. The uniforms were modeled after that of the Army nurse and cost $300-500. The present equivalent is slightly more than $4350-7250 in 2016 dollars. It's no wonder the people of Emmett, Idaho held a benefit to help Anne Campbell Atkinson get uniformed. Only after my very hot and heavy woolen uniform was made did I learn they also had summer uniforms. That comparison with the value of 1918 dollars made me feel better about having both sets made. I did not bother with the woolen underwear nor those black sateen bloomers the women also ignored! Now for my problem. I want to send historical groups, libraries, and schools who have seen my historical work a letter accompanied by a photograph of me in uniform. I know other groups when booking me will also want a photo. I'm not sure how to make a collage photo and also will need to single out one in particular to get the message across visually. Could you help me decide? Frankly I always hate pictures and these are many things, but definitely not "glamour shots." Sorry, but this really is saved rotated right-side-up with Headless as #9 or my attempt at German humor: Nein! 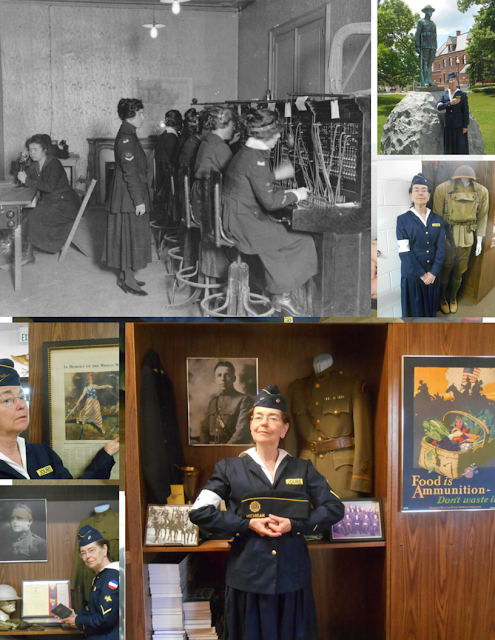 Photos were graciously taken in Frankenmuth at the Michigan's Military & Space Heroes Museum (on a very busy Memorial Day weekend!) and at the Doughboy Statue in Bay City at the General John J. Pershing Park next to the Sage Branch Library of the Bay County Library System. Others also most helpful in my preparation have included the Pride and Heritage Museum of Marine City and even as far away as Washington, D.C.'s Smithsonian National Museum of American Heritage Division of Armed Forces History and, of course, Oleda's own daughter, Michelle Christides, who has worked incredibly hard to get the story known. I look forward to her book about them and will gladly promote and offer it when it becomes available. In the meantime I need to get the word out and for that I need a best picture or pictures. I look forward to reactions here, Facebook, or my email. THANK YOU! UPDATE: I just realized I never posted the results here, although I did put it on Facebook. Taking all the reactions convinced me it was better to create a collage of pictures. This was the result. Next week (6/18/2016) maybe I can show some more of the research behind all of this. We'll see. It's a hectic time, including another preview of the program, so maybe I will take the quicker way and post another story. . . we'll see.